Many doll companies made small composition and hard plastic dolls during the era of 1948-1960s, one of which is the Duchess Doll Corporation. 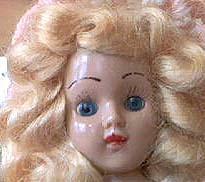 Dolls are often marked on the back with; Duchess Doll Corp 1948 or 1949. Dolls are 7-8" tall slender adult figure body jointed at neck and shoulders with non-bendable legs, painted or sleep eyes, wigged, and molded painted on low heeled shoes, with elaborate costumes stapled to dolls body. These are also called "Travel Dolls". Duchess dolls are inexpensive and often found still in their original box with tags. Alice in Wonderland, Bride, Brides of the World, Charm Girl, Cinderella. Continental Dolls; Dolly Madison & Queen Elizabeth Coronation dolls. Dale Evans, Danny the Groom boy doll. Dolls of all Nations; Gypsy, Miss Irish (wearing a dress with shamrock fabric), Morocco, Scotland Girl & Spain. Miss Tastee-Freez America's Sweetheart, Miss Valentine of 1951, Peter Pan and Tinker Bell. Some other companies that made similar small dolls are; Dress Me dolls 6-18", Fortune Doll Company made a Pam doll of hard plastic, 8" tall, sleep eyes, synthetic wig, dressed doll, Hollywood Doll Company made lots of 8" hard plastic dolls and Plastic Molded Arts Company (PMA), who made tons of small hard plastic dolls and also supplied parts and entire dolls to many companies.